Do you have a miniature breed dog or cat patient with a fracture? Our surgical team has expanded our fracture fixation options to include those that fit small and miniature breeds. 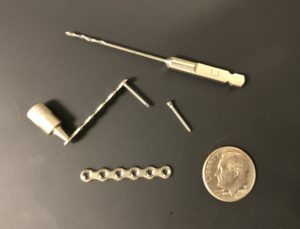 Our 1.5 and 2.0 locking mini plates are thinner and noticeably smaller than a dime (pictured below). It is unnecessary for the plate to intimately contact the underlying bone in all areas. As the screws are tightened, they "lock" to the plate, thus stabilizing the segments without needing to compress the bone to the plate. They do not disrupt the underlying cortical bone perfusion as much as conventional plates, which compress the undersurface of the plate to the cortical bone. 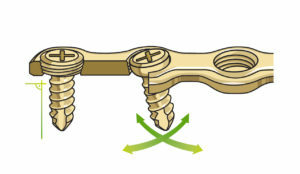 The screws are unlikely to loosen from the plate. Locking plate/screw systems have been shown to provide more stable fixation than conventional non-locking plate/screw systems.